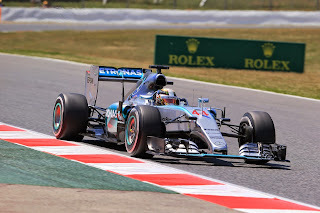 Talking about F1: The F1 blog: Might Lewis Hamilton have won in Spain by shunning his third stop? Might Lewis Hamilton have won in Spain by shunning his third stop? You'd probably noticed by now that F1 Grands Prix at Barcelona tend not to be the biggest in the thrill stakes. Overtaking is not the work of a moment at the Montmelo track. Some of its related stats - such as pole-sitters becoming race victors - are more Monaco than Monaco. With this in mind that during and after last Sunday's race there was such a focus on pit strategy rather than places being resolved by wheel-to-wheel stuff should not be a surprise. Might Lewis Hamilton have won out in Spain? Much of the related focus was on Sebastian Vettel and whether Ferrari should have 'covered off' the strategy of Lewis Hamilton who was behind him for the first half of the race. As it was just about everyone - including Seb it seemed - realised in hindsight that there would have been little point. The Mercedes simply were too quick to be defied from every available angle. As for the Merc themselves, well not much to see there? After all by consensus the race between them for first was done in Nico Rosberg's favour at the opening few corners when Nico led and Lewis sank to third behind Vettel. Well perhaps not. Lewis's 'plan B' strategy to get him ahead of Vettel involved three stops to Nico's more standard two, and before his third and final stop the Englishman in fact led the pair, and given he was on the hard compound tyres and had previously used the medium, there was no necessity from a rules point of view to stop again. Might he have stayed out so to got to the end on that set and, perhaps, won the race by doing so? 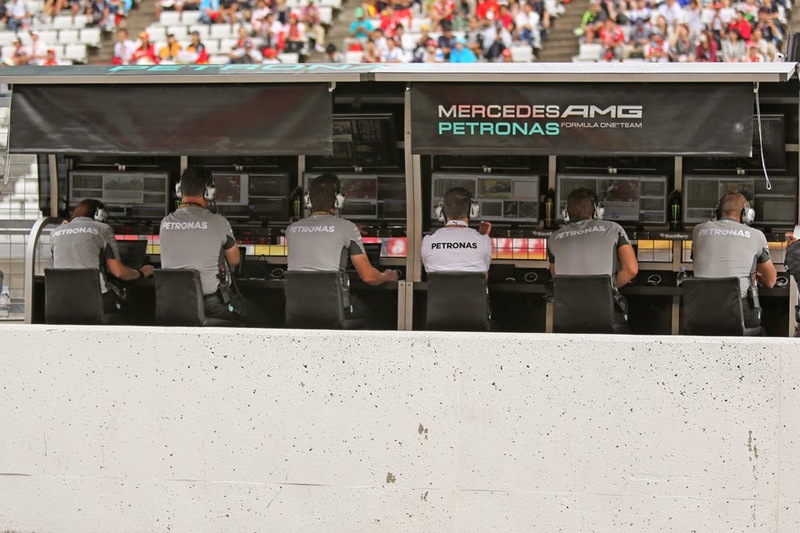 I first saw the possibility raised shortly after Lewis did indeed pit for the third and final time last Sunday by F1's very own stats guru Sean Kelly on Twitter. "Does anyone else question why Lewis Hamilton would have pitted from the lead just then, after spending all day complaining about dirty air?" he asked. Upon being challenged he elaborated: "You all say Hamilton would have never held off Rosberg on old/wrong tyres. Err, Bahrain 2014 anyone? Alonso stayed out in Hungary last year and ran the final 30-odd laps on one set, and came within 3 laps of winning. Bit safe, all this... I saw that tyre ran to 22 laps old on Friday without any significant deg at all." Of course we can cite reasons why it would not have been such a great idea. For Mercedes the 1-2 was all but guaranteed by this point; no need to risk it with fruity strategies particularly those that involve your two drivers fighting mano-a-mano on track. Lewis too early in his stint on the hards gave no indication of being one minded to get them to last. Perhaps it all would have been futile too - Nico was within three seconds of him and had softer and fresher tyres as well as a generous DRS advantage on the pit straight to help him get by. And yet, even with these Kelly might yet have been onto something. 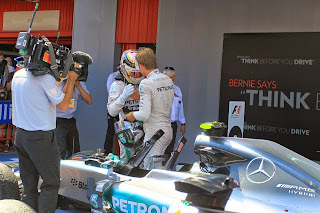 At the time he said it I was put in mind of the Grand Prix at this very venue in 2012, when Lewis - recovering from a back-of-the-grid start - did a similar strategy to the one Kelly suggested this time and then it worked out for him. He did the final 31 laps on a single set of hard tyres - as opposed to the 34 laps he'd have needed to have done last Sunday - and was still quick, rising from P14 after his final stop to a P8 finish. Of course it's not a perfect comparison for a number of reasons, but 2012 was the nadir of the gumball Pirellis so you'd imagine that if anything the tyres now are more durable. Lewis too was running in the midfield pack three years ago and presumably had to experience more sliding in other cars' turbulence. Is it possible that the Merc decision-makers were worried about the consequences of getting too clever on their strategy as Seb was still in the vicinity, thus risking giving right back the track position that it'd gone to such lengths to get? Well if so they shouldn't have been. By the time of his third stop Lewis had more than a pit stop in hand on Vettel on the watch, emerging from it a couple of seconds to the good, and in the laps prior to this he was clearly faster - sometimes a second a lap plus faster - as Seb struggled to get a tune out of his own hard tyres. And even if Lewis had 'hit the cliff' but pressed on for a time before giving in and pitting and had somehow managed to sink behind the Ferrari he'd have had fresh softer tyres against a rival really struggling for pace at that stage. Reclaiming second place would have been a formality surely. There were others in this race too that did stints of similar length as would have been required of Lewis. 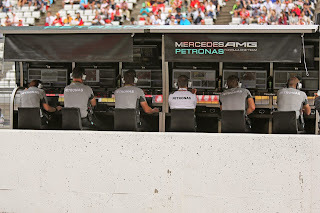 And foremost among them none other than Nico Rosberg, who managed a mid-race stint of 30 laps on the medium tyres indeed apparently without problem, while Lewis not only would have been on a harder compound additionally fuel loads would have been lower and the track more rubbered in. Plenty of others did single stints on the hard tyres not far short, for example both Toro Rossos managed stints of 28 laps each. There was nothing in the laptimes either to signal concern about degradation. In Nico's own 30 lap run his first full lap on them was a 1:31.846, while 30 laps later his final lap was a 1:31.999. Indeed he did a 1:31.2 a couple of laps earlier. While in Lewis's own stint on the hard tyre there was little sign of them losing their edge, with him setting a 1:29.965 two laps before pitting, which was half a tenth off his best of that stint as well as was quicker than anything Nico had done up until that point. Ted Kravitz afterwards said the tough-it-out approach for the Englishman was "borderline, but it might have happened...". Just about sums it up. be seen as favouring one driver over another? So why did Mercedes not go for it? We've given a few possible considerations already, while Mark Hughes in his Motor Sport magazine race report took up the question: "Could Hamilton have been left leading on his primes and not done the third stop? It would have entailed an unfeasibly long stint of 34 laps on tyres that had been pushed hard - and would have entailed Rosberg catching hand-over-fist on much faster tyres, which in turn would have enforced a wheel-to-wheel in-team battle and its attendant risks." So far, so fair enough. But Hughes hadn't finished: "It would also have been wholly unfair on Rosberg, who had dominated on merit right from the beginning of the weekend." Aha. This might have been the biggest consideration of all for Mercedes. That for various reasons the team was treating giving the potential impression that it was favouring one driver over another rather like it was an unexploded bomb. Lewis himself was asked about sticking it out on his hard tyres by Michael Schmidt in the post race press conference and he rather batted the notion away: "it wouldn't have been good to stay out, no. We choose to do a three stop quite early on" he insisted. His words didn't on the face of it reveal all that much either, though Kravitz during his famous Notebook broadcast did wonder. "I don't know whether he meant it 'wouldn't have been good' for the pace of the car" he said, "or 'wouldn't have been good' to defy team orders who wanted me to come in and pit again and that would have created an unnecessary mess with Nico Rosberg". Indeed we can think back also to the Malaysian race a few weeks ago when a few of us mused that Merc might have been better served by splitting its two cars' strategies upon the early safety car appearance, so that one of them did as the eventually-victorious Vettel did. But both pitted, and furthermore some suggested later that this could have been inspired at least in part by the Mercedes management's desire to be even-handed with its two pilots, something which was apparently confirmed by the team in the days after. We can think also to Toto Wolff telling us that strategy splitting and gambling will be less likely this season with Ferrari now a much closer challenger. It appears similar could well have been at play here. For both Lewis and Nico and their respective engineering staff the strategy dice have been confiscated by the team's top brass lest any of them are tempted to roll them it seems. And with uniformity comes conformity. In a title battle that could well again boil down to an intra-Mercedes battle like last year that a major source of variation has been taken away seems rather a pity. As I understand it, Mercedes delayed Rosberg's stop by two laps in order to give Lewis the chance to pit and come out with clear air so that he could run away from Seb. If Lewis had taken advantage of that to beat Rosberg, the loss of trust across the Mercedes garage would have been irreparable. Just to be clear too, I wasn't advocating Lewis personally taking the matter into his own hands and refusing to pit. I more had in mind Lewis's strategy team as a whole trying the strategy. If Ferrari or Williams fail to challenge Mercedes by mid season, I hope Mercedes management allow the two sides of the garage to battle it out.